While Sienna sales are up 2.3 per cent to 9,493 units through the first seven months of 2018, it still trails the market-leading Dodge Grand Caravan by a wide margin. Toyota has made all-wheel drive available to an additional trim line of the 2019 Sienna minivan and added Apple CarPlay as standard equipment across the board — all while slightly raising the base price. The Sienna starts at $36,960, shipping included. That’s $455 more than the outgoing 2018 model. The van will be offered in five trim levels, starting with the base seven-passenger Sienna. Standard equipment on the entry-level model include Entune 3.0 Audio, a 3.5-inch LCD display, all-season floor mats, 17-inch five-spoke alloy wheels, roof rails and projector style halogen headlamps. The van tops out at the seven-passenger XLE for $48,600, which can be bumped up to $55,800 with the inclusion of the limited package. That includes a JBL Synthesis Audio system, dual-screen rear seat BluRay entertainment system with two sets of wireless headphones, premium leather seating, Toyota’s “birds eye view” monitor system and more. All Sienna models are built around a 296 horsepower, 3.5-litre six-cylinder engine, mated to an eight-speed automatic transmission. 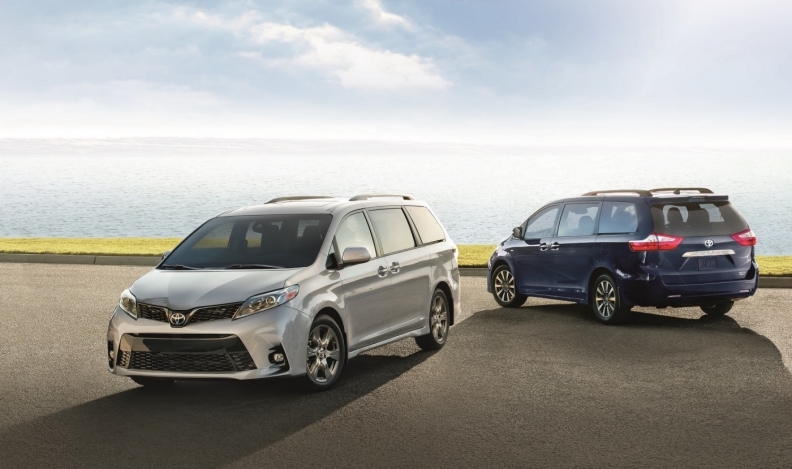 Every Sienna is standard equipped with Toyota’s Safety Sense bundle, which includes pre-collision system with pedestrian detection, lane departure alert with steering assist, automatic high beams and dynamic radar cruise control. Even as Caravan sales have slipped 26.5 per cent to 22,193 units, it remains the top-selling minivan in Canada.